The Urban Nomads: Five Years of This Journey! Happy Anniversary to me! It is that time of year again, when I take stock and look back on this journey of being an Urban Nomad in order to improve my fiscal situation. It has been exactly five years to the day that I have decided to do what I am doing. Exactly five years ago today I made the choice to seriously downgrade my lifestyle in order to get out of debt. In so doing and on that day in December of 2013, I started this blog with the intent to 1) force myself to do this and 2) let others learn from my mistakes. Five years later I am still making mistakes and still making those mistakes public, along with a success or two along the way. At this time of year I look back to see how I did with my goals for last year, and set new goals for the next year. So how did I do with last year’s goals? 1. I will break the cycle of running to debt when fiscal problems hit me, by funding my Mid-Term Account with enough cash to live on for two years. Okay, so this one I am claiming done, as this will be officially so, as of payday on this Friday (as in two days from now). I have tweaked this so as to keep some of that amount in my Mid-Term Account, yet the other part of that in the Long-Term Account so as to lump it in with the cash for my Grand Savings Plan! 2. I will continue my policy of keeping $1000.00 in my Main Account and keep the outstanding balances of all Credit Cards to $0.00 each and every payday. Okay, this one got off to a rocky start and I did carry a balance for the first quarter of the year. I also bought some things, larger ticket things, yet they were needed. 3. I will build up my Long-Term Account with whatever cash that I can spare. That one is for the most part on track, I did get myself going again, I would say from the second quarter onwards I have been doing this. 4. By the mid to late of 2019, I hope to have enough cash in there to buy a Quarter Section (at least). This one could be still held, as I would have enough to buy a Quarter Section, but even if I did, I wouldn’t have any cash to do anything with it. 1) I will hold true to my Westlock’s Fiscal Directives. 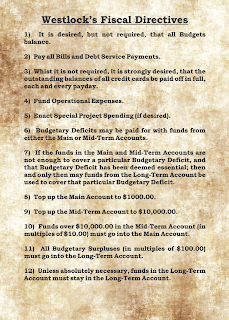 These are the fiscal rules that I have put in place so as to prevent me from getting into fiscal troubles. When I hold true to them, I do well, when I don’t, I don’t. 2) I will work my Grand Savings Plan! I still plan to have my target of $150,000.00 in savings before I head out to found that town of mine. My target date is April 7, 2022. Again these are simple goals that are building on my previous goals. That is a pattern, using my previous successes to keep moving forward to new successes. It is a pattern that has served me well, and one that I highly recommend. I am still out here freezing my tuchus off because I know how to survive out here and I want to found that town, so as to help others get ahead without them having to freeze their tuchuses off. As always: Keep your head up and keep moving forward! 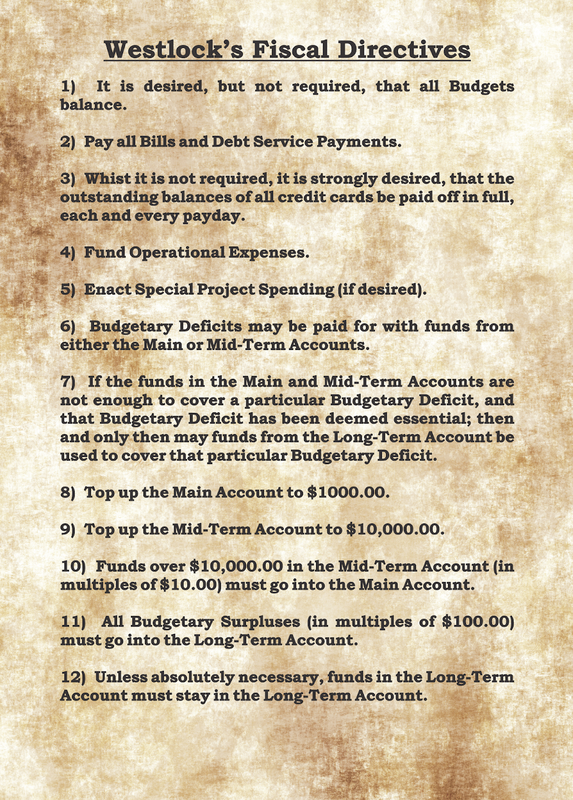 PS: For those interested, here are my Fiscal Directives.